You are here: Home / blog / Why You Must Become a Purple Cow! Why You Must Become a Purple Cow! One of the most brilliant online marketers is Seth Gordin. 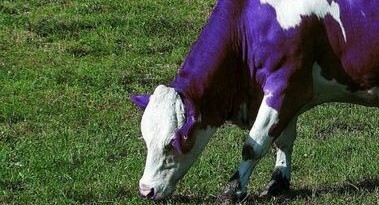 He came up with the ‘Purple Cow’ concept. Seth was driving along a country road and looking at boring brown cows. They all looked the same. Suppose you were the one driving on your country road and saw a purple cow, what would you do? If it were me, I would apply the brakes. Screech! Then get out of the car. Get my cell phone and take a good photo of the cow. I would then share it with my family and friends. This is how you need to market your business and your brand. People talk a lot about branding, -but what exactly is it? 1. A type of product manufactured by a particular company under a particular name. 2. A particular type or kind of something. 3. A brand of a product is the version of it that is made by one particular manufacturer. For your brand to stand out like a purple cow, it has to be like my favorite coffee shop. 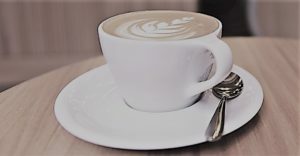 I love going to Panera Bread for coffee. In every city, there is a Panera coffee shop. Some cities have two. There is a Panera two miles away from my house, one five, another six and another eight miles. Guess which one I love going to? -The one that’s eight miles away. I certainly don’t go there because it’s the furthest from my house. Why would I want to spend more money on gas when I can go to the one that’s two miles away? I go there because of the way they welcome me when I arrive. I feel good when I’m there. I love taking my laptop to do some creative writing as I sip my coffee. The warm atmosphere at this Panera encourages my creativity. When I want to meet with friends, I tell them to meet me at this coffee shop. This means more business for them, free advertising and sharing from a customer. In the online space, whether you are a writer or coach, you have to find your unique selling point. What makes you stand out from other writers, trainers, and coaches? Don’t copy everyone. Be unique. This is a mistake I made in the beginning. I was trying to do what everyone else did online. Then I learned that sameness is boring. Natalie Sisson in her podcast talks about how you need to stop comparing yourself to others and copying them. Use your uniqueness to brand yourself. It’s Ok to admire someone and learn about their success, but avoid trying to copy everything about that person’s business. Don’t be afraid to walk on uncharted waters. Try out different stuff. The worst that can happen is, it will not work out. All successful businesses have had their fair share of failures. You’ll not be the first, and failing makes you wiser because you know what works and what doesn’t work. Strive to be different and unforgettable. Be good at what you do. Study daily, so you get better. Get a mentor who can assist you. When you are unique and good at what you do, you will get people’s interest, attention and time. You’ll not spend much money on advertising because like the purple cow , people will spread the word about your brand. Thanks for quoting me and listening to my podcast. I too love Seth and suggest more of us become Purple Cow’s!! Oh my! This is awesome! Thanks Natalie for visiting my website. I admire your work from a distance, I never knew you would find me. Wow. I am truly inspired Joyce. Thanks for visiting. Your blog inspires me too. I love your style. Thanks a lot for the amazing ideas. I’m happy you find the ideas useful. Thanks Joyce for the insights.